The proposed design is a huge improvement on the status quo, but it can be improved further with a few adjustments. The city has published a proposed design for the Claremont Access cycling facility and included detailed drawings [PDF]. Overall, the proposals for the Claremont Access mark a big step upwards from what we currently have. This is important because the Claremont Access provides key links for people to travel from A to B for many popular destinations. Examples include St. Joseph's Hospital, the Hunter Street GO Station and downtown Hamilton. The Claremont Access also provides connections to the Escarpment Rail Trail and other key active transportation infrastructure. However, there are some problems with the proposed design. On a path with a width of as little as three metres, it is proposed to mix upbound cyclists, downbound cyclists and pedestrians. Simply coasting downhill will result in people reaching speeds of 40-50 km/hr. This is quite safe in itself, but mixing those bicycle speeds with pedestrians is not. Currently, there are no sidewalks or any other pedestrian infrastructure on the Claremont Access. If pedestrian traffic is to be accommodated on the new infrastructure, this should be done by way of providing a sidewalk for pedestrians. In several places on the drawings, the proposed design puts a "Multi-Use Path" right next to a pedestrian sidewalk. One example is on the drawing entitled "West Fifth Street Pathway Figure #7." There are notes: "EXISTING SIDEWALK TO BE PROTECTED," and "3m MULTI-USE PATH PER PK-0700.10 OFFSET 5m +/- FROM EXISTING SIDEWALK TO AVOID EXISTING TREES." In this and every other case where there is a sidewalk, this should not be a multi-use path. It should be a cycling-only path and the sidewalk should be pedestrian-only. Another dangerous situation is seen in the proposed design on Figure #13, entitled "Hunter Street and West Avenue connection." 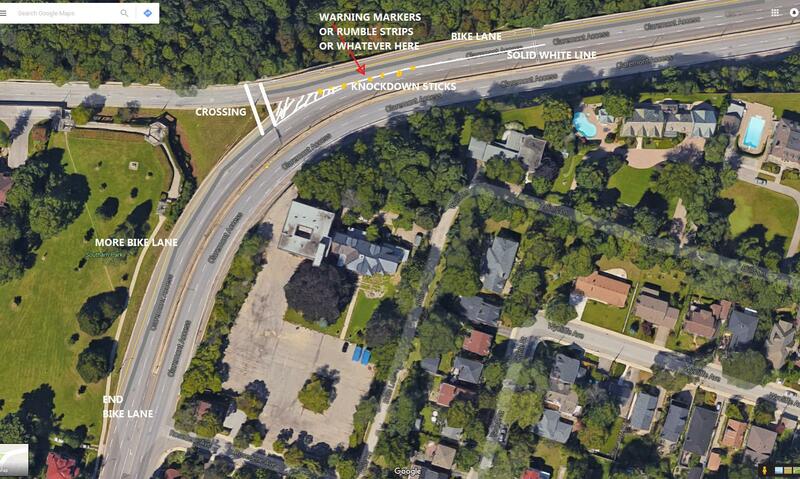 This proposed design places a "Stop" sign directed at cyclists at the bottom of the Mountain at Hunter Street. It is always Not Recommended to place Stop signs at the bottom of hills. It is human nature that people who have put so much effort into going up the hill will be very reluctant to have all that effort wasted by stopping at the bottom after coasting down. That makes the currently proposed design problematic, particularly because there will be a large volume of traffic heading to the Hunter Street GO station and downtown destinations. Fortunately, this problem is easily fixed. Hunter Street is currently one-way Westbound except for the last block east of Wellington Street. This last block should also be made one-way Westbound and right-of-way given to traffic on Hunter Street at its intersection with Wellington. The existing Hunter Street bike lanes can then be extended to connect seamlessly with the Claremont Access. Hunter Street currently has right-of-way at the next three intersections travelling West, which are at Spring Street, Liberty Street and Ferguson Avenue. This should not be changed at these three intersections. This fix enables someone to coast down the Claremont Access, and then seamlessly continue coasting Westbound on Hunter Street. This prevents wasted effort and momentum, and enables considerable savings of time and effort for people travelling to the GO station or other destinations. Most importantly, it avoids the dangerous situation of the present design. According to the Claremont Access Cycling Facilities – Criteria Rating Table from the Openhouse, looks like they can fund almost every other project for the same cost of the Claremont Project at $1.8M. Looking at the designs, I was a little worried about the comparative lack of elaboration on the Upper James connections.... to me the UpperJames and St Joe's connections are the most important ones, since they connect the bike track to more central locations than the "default" endpoints do. Also, I had one small request: a lookout / parkette halfway up. At the spot where the Claremont widens from 3 lanes to 4, there's an opportunity to claim some space for the bike track by delaying the widening of the car lanes. Clear some of the brush to open up the view and put some benches and a picnic table there, so leisure-cyclists can have a nice break in their climb. If it's a matter of the cost or space of a dedicated pedestrian route along the Claremont, I wonder if there's an opportunity to beef up the existing Bruce Trail segment that runs parallel to the Claremont between Arkledun and the John Mountain Road Trail/top of the James Stairs so that it can serve as the dedicated pedestrian route. I would suggest narrowing the traffic lanes by a foot or two each which would free up tons of space for a pedestrian path next to the cycle track. That might also help keep drivers from doing 120km/hr since it's built like a 400-series highway. That is a great idea! This would provide excellent separation of pedestrian and motor vehicle traffic. That would provide a pedestrian path that would be very pleasant to use. http://www.hamiltonnews.com/news-story/6825360-skelly-wants-to-make-upper-james-pedestrian-friendly/ "Donna Skelly wants to see more trees, boulevards and other amenities added along Upper James to make it safer and more welcoming for pedestrians." Maybe there is still some chance of some changes on Upper James. My wife & I attended the info. session and I would say I thought the plan is fairly good. One thing I thought is missing is connecting east on the Mountain. Presently the city is in the process of installing traffic lights at the intersection of Upper James and Inverness Ave, these have been badly needed for many years. The suggested crossing now would require you to take your bike up some stairs and through Southam Park to connect with Inverness West at Tanner St. Tanner is more like an entrance to the park and the path they show is really just a desire path used to go through the park. If it is possible to make a second crossing closer to the bend coming off the access and create a bike lane to the new lights you could easily connect from Inverness East to the existing bike lane on Queensdale or connect to the Mountain Park path. It is really too bad the down bound lane closest to the escarpment is unusable as that would have solved separating cyclist going down from pedestrians and up bound cyclists. On Tuesday April 12, 2016, just shortly after 11:00am, a Hamilton police officer was in the area of Main Street East and the Claremount Access conducting traffic related enforcement. While situated in the area, the officer observed a 2016 Toyota Corolla travelling southbound along the Claremont Access, which he suspected was speeding well above the posted 70km/hr speed limit. The officer then used a speed measuring device and obtained a reading of 132km/hr. The officer proceeded to stop the vehicle. Enforcement is part of the answer. Fixed it for you... Road design also plays a role. FWIW, it is indeed easily possible to hit 120kph for a stretch without fearing for your life on the Claremont -- it shouldn't easily be possible to feel calm at 120kph on Claremont. And road design plays a WAY bigger role than enforcement. Just look at what Sweden has done to get serious about Vision Zero. This has been proven over and over around the world. Enforcement is one small part of the solution. I'd go so far as to argue that a public call for enforcement is most valuable as an indicator that the street design needs review. Agreed. That's my biggest worry about this project - the Upper James connection is a very important one, and it sounds like they're making a bad compromise on it. The document they released was extremely sparse on details about that connection, so hopefully that one they're still figuring out. I'm sure the big worry with using the obvious crossing right at the split is the speed of traffic - there used to be a crossing there and it's been closed off. But imho, trying to make that crossing work would be the best option. and a desire path leading up to that barrier! I emailed Daryl Bender to let him know that I would like the bike lanes to stay on the south edge of Hunter, as a contiguous cycle track all the way. Please, no stop sign at the bottom of the hill. Another thing is about seeing if this can be safely made as a multi-use trail, so pedestrians can enjoy walking up Claremont Access, on the scenic edge. Uphill bikes can either go in the middle or share with pedestrians -- uphill bikes will usually go slower than a jogger's speed, anyway. That opening was put in for the 2003 Bike race, the same as the turn around where the access ramp joins at West 5th. I'm not sure it would be a bad crossing point as it actually is more visible than the existing one right at the stairs from Southam Park. And don't forget that with the addition of the cycle track on Claremont, the extension to West 5th will be only one lane wide so a) it will be a shorter distance to cross and b) it will be harder to drive at dangerously high speeds on a single lane. I submitted a lengthy response to the city (daryl.bender@hamilton.ca) but to date have not heard anything further or seen anything on the plan/study site. Has there been an update of any kind? tldr: Because they've dragged their feet on other cycling projects, this project is likely to break ground 2018 at the absolute earliest. Thanks, I missed that. Dismal news.